A programming language is more than just a means for instructing a computer to perform tasks. The language also serves as a framework within which we organize our ideas about processes. Programs serve to communicate those ideas among the members of a programming community. Thus, programs must be written for people to read, and only incidentally for machines to execute. In programming, we deal with two kinds of elements: functions and data. (Soon we will discover that they are really not so distinct.) Informally, data is stuff that we want to manipulate, and functions describe the rules for manipulating the data. Thus, any powerful programming language should be able to describe primitive data and primitive functions and should have methods for combining and abstracting both functions and data. Having experimented with the full Python interpreter, we now must start anew, methodically developing the Python language piece by piece. Be patient if the examples seem simplistic --- more exciting material is soon to come. We begin with primitive expressions. One kind of primitive expression is a number. More precisely, the expression that you type consists of the numerals that represent the number in base 10. These mathematical expressions use infix notation, where the operator (e.g., +, -, *, or /) appears in between the operands (numbers). Python includes many ways to form compound expressions. Rather than attempt to enumerate them all immediately, we will introduce new expression forms as we go, along with the language features that they support. The most important kind of compound expression is a call expression, which applies a function to some arguments. Recall from algebra that the mathematical notion of a function is a mapping from some input arguments to an output value. For instance, the max function maps its inputs to a single output, which is the largest of the inputs. A function in Python is more than just an input-output mapping; it describes a computational process. However, the way in which Python expresses function application is the same as in mathematics. This call expression has subexpressions: the operator precedes parentheses, which enclose a comma-delimited list of operands. The operator must be a function. The operands can be any values; in this case they are numbers. When this call expression is evaluated, we say that the function max is called with arguments 7.5 and 9.5, and returns a value of 9.5. The order of the arguments in a call expression matters. For instance, the function pow raises its first argument to the power of its second argument. No ambiguity can arise, because the function name always precedes its arguments. Second, function notation extends in a straightforward way to nested expressions, where the elements are themselves compound expressions. In nested call expressions, unlike compound infix expressions, the structure of the nesting is entirely explicit in the parentheses. There is no limit (in principle) to the depth of such nesting and to the overall complexity of the expressions that the Python interpreter can evaluate. However, humans quickly get confused by multi-level nesting. An important role for you as a programmer is to structure expressions so that they remain interpretable by yourself, your programming partners, and others who may read your code in the future. Finally, mathematical notation has a great variety of forms: multiplication appears between terms, exponents appear as superscripts, division as a horizontal bar, and a square root as a roof with slanted siding. Some of this notation is very hard to type! However, all of this complexity can be unified via the notation of call expressions. While Python supports common mathematical operators using infix notation (like + and -), any operator can be expressed as a function with a name. An import statement designates a module name (e.g., operator or math), and then lists the named attributes of that module to import (e.g., sqrt or exp). The Python 3 Library Docs list the functions defined by each module, such as the math module. However, this documentation is written for developers who know the whole language well. For now, you may find that experimenting with a function tells you more about its behavior than reading the documemtation. As you become familiar with the Python language and vocabulary, this documentation will become a valuable reference source. We can also assign multiple values to multiple names in a single statement, where names and expressions are separated by commas. The = symbol is called the assignment operator in Python (and many other languages). 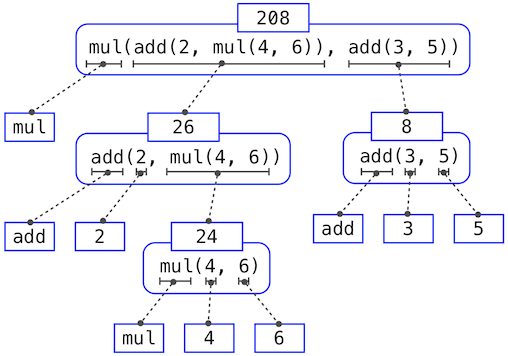 Assignment is Python&apos;s simplest means of abstraction, for it allows us to use simple names to refer to the results of compound operations, such as the area computed above. In this way, complex programs are constructed by building, step by step, computational objects of increasing complexity. In Python, the names bound via assignment are often called variable names because they can be bound to a variety of different values in the course of executing a program. Even this simple procedure illustrates some important points about processes in general. The first step dictates that in order to accomplish the evaluation process for a call expression we must first evaluate other expressions. Thus, the evaluation procedure is recursive in nature; that is, it includes, as one of its steps, the need to invoke the rule itself. requires that this evaluation procedure be applied four times. If we draw each expression that we evaluate, we can visualize the hierarchical structure of this process. This illustration is called an expression tree. In computer science, trees grow from the top down. The objects at each point in a tree are called nodes; in this case, they are expressions paired with their values. Evaluating its root, the full expression, requires first evaluating the branches that are its subexpressions. The leaf expressions (that is, nodes with no branches stemming from them) represent either functions or numbers. The interior nodes have two parts: the call expression to which our evaluation rule is applied, and the result of that expression. Viewing evaluation in terms of this tree, we can imagine that the values of the operands percolate upward, starting from the terminal nodes and then combining at higher and higher levels. without specifying any information about the environment that would provide a meaning for the name x (or even for the name add). Environments provide the context in which evaluation takes place, which plays an important role in our understanding of program execution. does not return a value nor evaluate a function on some arguments, since the purpose of assignment is instead to bind a name to a value. In general, statements are not evaluated but executed; they do not produce a value but instead make some change. Each type of statement or expression has its own evaluation or execution procedure, which we will introduce incrementally as we proceed. A pedantic note: when we say that "a numeral evaluates to a number," we actually mean that the Python interpreter evaluates a numeral to a number. It is the interpreter which endows meaning to the programming language. Given that the interpreter is a fixed program that always behaves consistently, we can loosely say that numerals (and expressions) themselves evaluate to values in the context of Python programs. As we continue to develop a formal model of evaluation, we will find that diagramming the internal state of the interpreter helps us track the progress of our evaluation procedure. An essential part of these diagrams is a representation of a function. The function abs is pure. Pure functions have the property that applying them has no effects beyond returning a value. While print and abs may appear to be similar in these examples, they work in fundamentally different ways. The value that print returns is always None, a special Python value that represents nothing. The interactive Python interpreter does not automatically print the value None. In the case of print, the function itself is printing output as a side effect of being called. If you find this output to be unexpected, draw an expression tree to clarify why evaluating this expression produces this peculiar output. Signatures. Functions differ in the number of arguments that they are allowed to take. To track these requirements, we draw each function in a way that shows the function name and names of its arguments. The function abs takes only one argument called number; providing more or fewer will result in an error. The function print can take an arbitrary number of arguments, hence its rendering as print(...). A description of the arguments that a function can take is called the function&apos;s signature.